Some people think that reviewers should never write up material that they suspect they may not like. If I know I don’t like Kevin Costner, it makes no sense for me to check out all his films, correct? Yes, but it’s not that simple. To make the site appealing to all, we need to cover a wide variety of titles, and since only two people write for DVD Movie Guide, inevitably one of us will need to watch something we’d otherwise skip. And that’s why Eastwood After Hours: Live At Carnegie Hall entered my DVD player. While I love music, jazz has never been my cup of tea. Actually, that’s not totally true. During my first semester of college, I took a course in jazz appreciation, and it did give me a little more recognition of the form, at least briefly. I enjoyed the class and took a particular shine to the unusual meanderings of Thelonious Monk. I even went to a Wynton Marsalis show in December 1986. However, I admit it - I was a poseur. I liked the idea of being a jazz fan, but the music just didn’t do it for me, and that’s not changed over the last 15 years. I like songs, and too much jazz is excessively loosey-goosey for my preference. I enjoy a well-constructed three or four minute pop or rock tune; to be sure, expansions are fine at times, but I think jazz relies too much on long and rambling free form explorations. Jazz worships at the altar of the instrumentalist, and that’s my main problem with it. I prefer music that values the group over the individual. I’m sure some jazz aficionados will argue with me, but that’s how I see the genre; much of the time it offers showy and pointless soloing that seems to exist mainly to glorify the performer. I’m not here to provide a discourse on what I interpret as the pros and cons of jazz, but I thought I needed to mention my opinions before I discussed Eastwood. Clearly my feelings about jazz would influence my thoughts about the program, so I felt it was appropriate to mention my predisposition. Did anything about Eastwood change my mind? No. It offered a moderately pleasant experience, but it wasn’t anything I’d care to watch again. 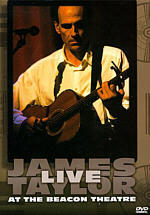 The DVD includes an October 1996 concert staged at New York’s Carnegie Hall. This performance saluted jazz fan and supporter Clint Eastwood. He often uses jazz in his movies, and that was the theme of the evening; most of the numbers played that evening also appeared in Eastwood flicks like In the Line of Fire and Play Misty For Me. For the most part, the DVD consists of these performances. In addition, occasionally we see interview snippets from Eastwood between songs. He discusses tidbits such as his personal exposure to jazz, his use of the music in his movies, and his thoughts about various artists. In addition, scenes from the appropriate movies appear during the live performances. The latter element is the worst misfire perpetrated by the filmmakers. When silent, the clips offer a distraction. No, the concert isn’t the liveliest visual experience imaginable, but so be it - the DVD should replicate the original performance. Nonetheless, I could live with simple photographic images. Unfortunately, the program often inserts soundbites from the flicks on top of the music! That’s a terrible mistake. The sound interferes with the concert and really becomes annoying at times. On the other hand, the Eastwood interviews provide the best parts of the program. 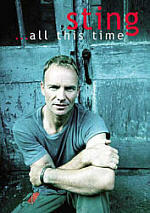 He seems relaxed and interested and he provides some quality information about his roots and his career. Unfortunately, we only find a few of these snippets. I like them a lot, but they pop up too infrequently. 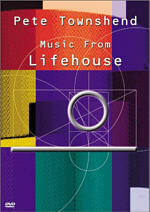 That leaves the emphasis squarely on the music. As I already noted, nothing about Eastwood changed my mind about jazz. For better or for worse, the genre’s pros and cons seem to be on display here. Some people love the kind of flashy soloing evident during the medley of “Straight No Chaser” and “Now’s the Time” done by Joshua Redman and James Carter; I don’t. And who thought it was a good idea to do jazz versions of “Rawhide” and the theme to The Good, the Bad and the Ugly? Probably my favorite number was also possibly the simplest: Jay McShann’s rendition of “Hootie’s Blues”. It’s a solid little blues number that stood out positively amidst the showier elements heard elsewhere. Ironically, one of the concert’s sturdiest songs, “The First Time Ever I Saw Your Face”, provides easily the worst performance of the night. Singer Jimmy Scott’s frightfully stilted delivery - complemented by his awkward physical gestures - totally ruined a decent (if sappy) tune. Scott seemed permanently behind the tempo and couldn’t possibly have done a worse job. Gary LeMel’s version of “’Round Midnight” isn’t that much better; he seems better suited for some Vegas lounge. Despite those misfires and my general apathy toward jazz, I will say that Eastwood After Hours offers a decent set of music. If nothing else, it’s a nice overview of a mix of styles, so folks who want to check out the genre may benefit from it. If you’re like me and you already know you don’t like jazz, however, don’t expect any revelations. 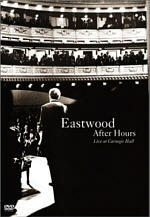 Eastwood After Hours: Live At Carnegie Hall appears in an aspect ratio of 1.33:1 on this single-sided, single-layered DVD; due to those dimensions, the image has not been enhanced for 16X9 televisions. The disc offered a pretty typical videotaped program that looked reasonably good for the most part. Sharpness came across as adequate. Most parts appeared acceptably crisp and accurate. However, wider images - and even occasional two-shots - seemed moderately fuzzy. These concerns didn’t become a serious problem, though, as the show generally was appropriately well defined. I saw a little shimmering on a few occasions but I witnessed no jagged edges or signs of edge enhancement. Source flaws also caused no concerns. Eastwood stuck with subdued colors, and the image presented them in a mildly murky manner. A blue background dominated the proceedings, and it seemed a bit muddy. However, that wasn’t a big issue, and the picture seemed to represent other hues with reasonable accuracy. Black levels came across as nicely deep and dense, and shadow detail was acceptable. Shots of Clint in the audience appeared hard to see, but that was to be expected; to make him more visible, extra lighting would have been needed, and that would have been dumb. Overall, the image seemed good but unexceptional. The Dolby Surround 2.0 soundtrack of Eastwood After Hours worked reasonably well as a whole. Not surprisingly, the soundfield remained almost totally oriented toward the front channels. It used the surrounds solely for general reinforcement of the crowd and the music. Stereo imaging in the front appeared somewhat loose at times. For parts of the show, I heard nice delineation across the forward speakers. For example, when two pianists played a number, the mix split them cleanly toward each side. However, other numbers featured a solo piano too broadly; that instrument would dominate the track and blanket the front, whereas the other players seemed stuck in the middle. This wasn’t a terrible misstep, but it was odd and a little distracting at times. Happily, the quality of the audio helped make up for the strange mix. Speech and vocals seemed natural and warm, with no edginess or other problems. The various instruments appeared to be clear and accurate. They showed nice definition and fidelity at all times. Highs were bright and vibrant, while bass response seemed deep and rich. The audio of Eastwood offered a positive surprise, as I didn’t expect much from the 2.0 track. While the soundfield appeared a little strange, I still felt the audio worked nicely. We find only a few minor extras on Eastwood After Hours. Most significant is Eastwood After Dark, a 10-minute and 25-second featurette. It shows some behind the scenes shots from the concert but mostly consists of short interview clips. We hear from Eastwood, musical director Lennie Niehaus, music producer Phil Ramone, and musicians Jon Faddis, Kevin Mahogany, Kyle Eastwood, Thelonious Monk Jr., Christian McBride, Jimmy Scott, Claude Williams, Gary LeMel, Roy Hargrove, Charles McPherson, George Wein, James Carter, and Joshua Redman. They discuss a mix of subjects, but mostly they discuss Eastwood and his appreciation for jazz. The program includes a few interesting bits but generally seems fluffy and superfluous. Two text pieces round out the disc. Crew lists a few folks but only offers a biographical entry for producer/director Bruce Ricker. Production Notes provides a short discussion of the use of jazz in Eastwood flicks. I found Eastwood After Hours: Live At Carnegie Hall to offer a competent but not terribly compelling program. While the show was fairly well executed, I didn’t discover anything tremendously exciting about it, though jazz fans may feel differently. The DVD provided good but unexceptional picture and sound and lacked substantial extras. If you’re partial to the music, Eastwood might be a good bet, but others likely won’t get much from it.